As a woman who cohabitates with a boyfriend who has a near-chest-length beard, I am keenly aware of this predicament. During certain meals, I feel like a Discovery Channel gorilla, picking errant bits of rice out of my boyfriend’s facial hair in some facsimile of a primitive grooming ritual. I can sympathize with Harden; that’s a weird place to be on a first date. “When I’m, like, going on blind dates, I’ll wait till I get around people I actually am comfortable around, because then they’ll tell me I have stuff in my beard,” Harden tells GQ. In the years I’ve dated my bearded beau, I’ve learned that certain foods are much more easily eaten by those with ample facial hair. Small grains are probably the worst option. After a dinner involving quinoa, my boyfriend looks like he’s sprinkled bird seed across his face. Granola is tough, too, as is yogurt, which tends to dribble everywhere. (Parfaits are a perfect storm.) Anything that generates crumbs is going to require a post-meal grooming session: cake, chips, pretzels, and don’t even get me started on cornbread. But Harden needn’t be so shy. It’s just a matter of choosing meals wisely. Steaks, chicken, and pasta that can be cut into pieces and easily inserted by a fork into one’s mouth generally leave the beard in pristine shape. Ditto for sushi, dumplings, and pizza. 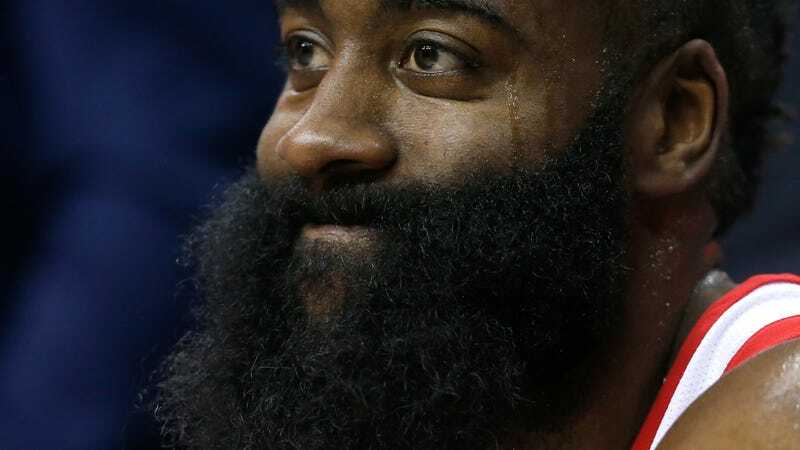 Or, rather than worrying so much about whether he has an entire leftovers’ portion caught in his beard, Harden could embrace the occasional whiskery mess. I’m proof that there are dates who can look past it. Are we supposed to wash mushrooms or not?